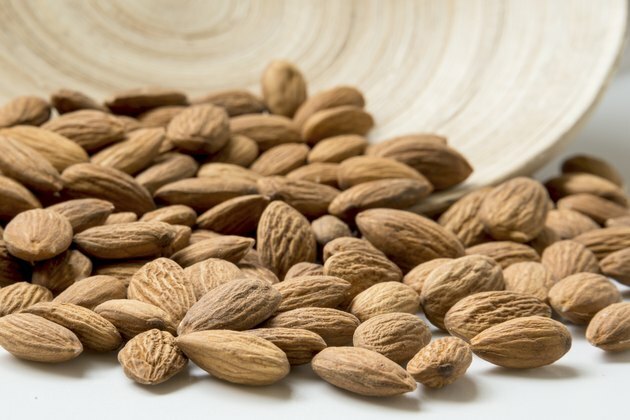 Are Almond Nuts Good for Bodybuilding? Nicholas Doukas is an all-natural bodybuilder and nutritionist with an associate degree in life science and nutritional biochemistry. His background includes a strong concentration in anatomy, physiology, organic topics and biochemistry, microbiology, human nutrition, food production and food safety. Doukas specializes in healthy body composition via proper training and nutrition. If you're a bodybuilder looking for a quality nutrition source to help build lean muscle mass, look no further than almonds. Almonds contain many vital nutrients, including protein and healthy unsaturated fats. Since protein is the main component for increasing your lean body mass, almonds will definitely fit the bill as a solid choice for your training table. Lipids are an important component of your cells. They help create the phospholipid bilayer that separates the aqueous interior of the cell from the surrounding fluid. Almonds contain plenty of healthy fats, including both monounsaturated and polyunsaturated. In fact, a 1 oz. serving of almonds provides 10 g of mono- and 3 g of polyunsaturated fat, while containing only 1 1/2 g of saturated fat. They also contain oleic acid, an omega-9 fatty acid. Fat can help provide energy for the body, as well as playing a structural role. A proper amount of healthy fat in your diet also helps you manage inflammation, something that is key in reaching your bodybuilding goals. Proteins are the structural elements of your muscle, skin and cartilage. They also perform other metabolic functions, such as transporting oxygen to the blood, acting as antibodies to fight disease, and functioning as hormones to regulate your metabolic processes. Proteins reign supreme as the working molecules of life. Fortunately, almonds are loaded with this vitally important macronutrient. One ounce of almonds contains 6 g of protein. As a bodybuilder, protein is arguably your most important resource for building muscle mass. Clearly, almonds are useful for any hard-working trainer. Almonds also contain a considerable quantity of vitamin E. One ounce has 10 international units, IUs, giving you a whopping 35 percent of your daily value. Vitamin E has an antioxidant effect and also has a regulatory function for your body's enzymatic activity. It also slows down the growth of smooth muscle cells, which can help prevent atherosclerosis. Many bodybuilders consume vitamin E in synthetic or natural forms to enjoy the health benefits of this important fat-soluble vitamin. Because of this, almonds can be a welcome addition to your arsenal of nutrients. In addition to the aforementioned macronutrients and vitamin E, almonds also contain many other vitamins and minerals. These include vitamins like thiamin, riboflavin, niacin, vitamin B-6 and folate. As for minerals, almonds have potassium, iron, calcium, magnesium, phosphorous, zinc and copper. They also provide a variety of phytochemicals that are invaluable to your health. Because of the nutrient content, almonds are a potent force for combating conditions that lead to heart disease. Since any smart bodybuilder knows you can't train optimally with poor overall health, it's obvious that almonds are an appropriate fit if you are looking to build the best body you can. Are Almonds Good for Losing Weight? Can Almonds Raise Your Cholesterol?